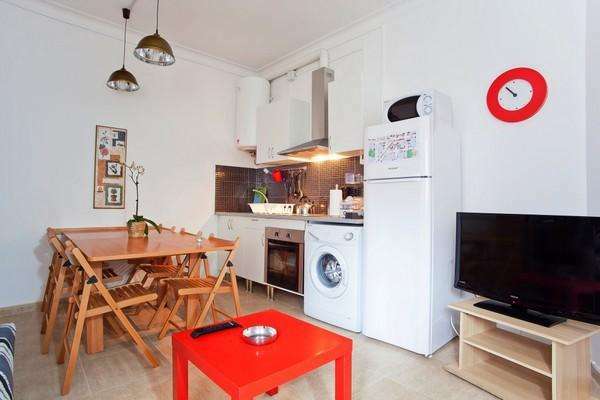 For large groups heading to the Catalan capital, looking to experience all that this vibrant city has to offer, this lovely three-bedroom apartment in Barcelona is a great choice! Situated in the beautiful Eixample, an area that boasts some of the finest tapas bars in the city, and some amazing attractions like Gaudí´s Casa Batlló, guests staying here will enjoy an all-round Barcelona experience. This spacious apartment enjoys a simplistic yet homey design, with a neutral color scheme found which is enhanced by carefully selected bright trinkets that decorate the apartment. The living room is furnished with a double sofa bed, and a TV, perfect for unwinding after a day of sightseeing. And for those who need to get in touch with friends and family back home, rest assured, an Internet connection is also available. The fully equipped kitchen has plenty of the utensils and appliances needed to create your very own home-cooked meals, in the comfort and privacy of your vacation residence. Two of the three bedrooms are furnished with double beds, while the third room has three single beds, meaning that this apartment can accommodate up to ten people. A single sofa bed can also be found in this idyllic apartment This locale has two bathrooms, one fitted with a walk-in shower. Please note: In this apartment check-ins from 8pm to midnight and from 6am to 8am have a supplement of 30 Euro. Check-ins from midnight to 6am have a supplement of 50 Euro. Check-ins/outs on Sundays and public holidays have a supplement of 30 Euro.